I still have my East Coast Cold. Someone told me a surefire cure was to eat two raw cloves of garlic. So I gave it a try, this is some nasty stuff. I chewed it up and it burns and let me tell you, drinking orange juice doesn’t help the burn. I just chewed quickly and swallowed it down with some water. Maybe I negated the efficiancy by drinking water and juice but I’ll probably reek or garlic now. We will see how well this works, maybe I’ll try kimchee next time. Anyone got any surefire cold cures? Hey man. Just saw your D.C. pics. Did you make it up to Adams Morgan or Dupont Circle? I lived in the Morgan for three years. Next time, let me know when you go; I could've given you some great pointers. I still can't get over that WWII memorial smack dab in the middle of the mall. It's a damn eyesore. And dude, you're crazy to eat garlic cloves. What's next – leeching? Eating raw garlic cloves? I'd rather live with a cold! Eating garlic cloves is my worst nightmare. Although it seems to really be an East Coast remedy. There is a tea store here in Portland that has all kinds of teas to cure anything – stress, hangovers and colds. The cold one has tons of garlic in it. Hopefully it works and you feel better! Next time you are on the East Coast, a trip further north is a must!!! I've always been told that garlic works, too. 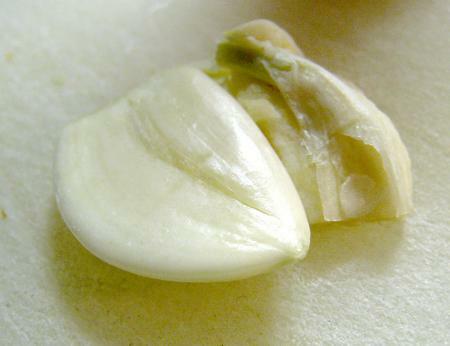 In China, they eat raw garlic all the time in the winter to keep off colds. Have you tried ginger? That seems to work, too. Just cut up a bunch of fresh ginger, mash it a bit, then boil it in water for a while (lat least 15 mins). Strain out the ginger and drink the water. I used to do this when I was a student in Boston and it always seemed to work. It makes you hot and sweaty though, so it's best before bed or a nap. You could also try just eating the ginger, but that's hard, too. Sooooooooooooooooooooooo? How's that cold doing? You going to update as to whether your "friend" was right or not!?!?!?!?! Muhahahahahaha! I never said chase it with juice….in fact, bread or crackers would have probably been better than juice. My latest is someone told me to pour straight tumeric juice up my nose (laying back) to clear out my sinuses…uh, yeah, YOU have not experienced burning until you try this cute little method. It can be likened to shooting a fire torch up your nostrils…and no, it didn't work for me…still dealing with the sinus infection after twelve days. Bleh! Well, I happen to be drinking orange juice before I gave the garlic a try thus it was handy. Kinda like Dumb & Dumber eating an Atomic Pepper and drinking mustard because it happened to be close by. But OJ really doesn't work against the garlic, water works a bit better. I'm just about over the cold, just got a bit of a cough and a couple sniffles but I feel much better. Sleep appears to be the best remedy at this point, sleeping most of the day helps though I can only do that on days-off. C'mon! It's been over two weeks! You can't tell me you still have that killer cold! I got over the cold about 99.9% about a week ago, still have a touch of a cough sometimes. I don't know about the garlic working. I think the main cure was just to rest, I spent two of my days off just resting and that really sped things up.